Cormac Whelan is the CEO of Nokia UK and Ireland. He joined the company nearly 8 years ago as Vice President Global Accounts and has led it through some significant changes. He has previously worked for BT, UUNET and Motorola Codex. ET: Cormac. Could you give me a 30 second elevator pitch for Nokia UK and Ireland. 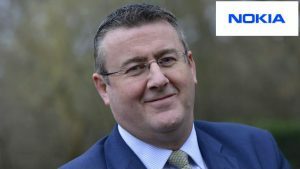 Cormac Whelan: Following the acquisition of Alcatel-Lucent that completed in January 2016, Nokia is now one of the world’s leading end-to-end solution providers for network infrastructure. Our prime customers are large and medium sized carriers such as BT or Virgin Media or Sky or a number of the fibre players. We also play in the enterprise place, with particular emphasis on the transport industry. Both road and rail. Also in the energy space, and government and public sector. We provide end-to-end solutions across software and hardware, managed services, and we are a prime service provider to all major fixed and mobile network infrastructures in both the UK and Ireland. Cormac Whelan: Personally, my first boss. A guy called Dermot Desmond, who is an entrepreneur and a very successful business leader in Ireland. (He )set up a number of different businesses over there, starting with money broking, stockbroking, and eventually had the blueprint for the International Financial Services Centre in Dublin. He’s a true business leader and a visionary. He’s also a very strong driver of people, and the number one thing he taught me was: always hire the best, and if you can’t afford them, still hire them. Cormac Whelan: Open, transparent and pretty straightforward. I’m a pretty clear and direct individual. I don’t deal in nuance, and I think that open, transparent communications is a very important thing. One of the most important things for all employees and managers and leaders in an organisation to be, however big or small the company is. ET: What’s your business challenges for the next 12 months? Cormac Whelan: We have many. On the commercial front, customers who need to get more for less out of their networks and their budgets. We have Brexit and the challenges it, as yet unknown, that it may or may not bring to the business environment as well as the personal environment of people on the ground. We have also said there are some supply chain issues around the world that the whole industry of tech is facing. Of course, we all live in a world of uncertainty these days in terms of political and terrorist climates. So yeah, there are a lot of things on a lot of different fronts going on right now. One needs to be quite broad in one’s view of what’s going on, and doing a lot of advanced planning. ET: In terms of the supply chain issues are you talking about trade barriers? Cormac Whelan: No, Trade barriers and the post-Brexit transaction world is yet to be seen, and will cause many industries, some concerns. But no, I’m actually talking more about in the technology industry as a whole in the world, I mentioned there is a technology supply chain challenge around semi-conductors and silicon or a number of other things, because everything in the world is now run pretty much electronically somehow. We need to make sure that supply of basic physical components remains up to speed with the demands on it, from industry around the world. ET: What are your personal challenges for the next 12 months? Cormac Whelan: Good question. One is trying to find more time. There’s so much going on. 5G is now upon us; we’re moving from trial phase into 2019 and 2020 it’ll be live deployment. We have strong businesses, but we have to keep them maintaining and running and growing, and just try to find personal time. I’m not a fan of the term ‘work-life balance’, but I am a fan of the term ‘work-life integration’. Trying to make sure that mental wellbeing remains part of the agenda as well as just business wellbeing. Cormac Whelan: A long time ago, when I was an installation customer service engineer at a different company, we were doing a very large network upgrade through my network management system. We did manage to plug the network management system into the wrong node, and took out the whole of the Rank Xerox network in the Netherlands. That was a challenge. That one stands out in my memory as a particularly bad day as a service engineer. ET: I assume overcoming it was unplugging it, at least in part? Cormac Whelan: Well actually, by plugging into the wrong node, we downloaded all of Switzerland’s network configuration to the Netherlands network, so what we had to do was undo that. Cormac Whelan: From a business point of view. There have been some very, very big deals we’ve won, which were very, very, very tough to win. New customers to break into on a large scale. There’s been a few of those, particularly in my Alcatel-Lucent and Nokia career over the last seven years. They were major breakthroughs, and they were changing the trajectory of our company and our industry here in the UK. Major breakthroughs in new areas proving the value and worth of what we can do, and the customers putting their trust in you is always a big proud moment. ET: What’s the latest business book you read, favourite book and/or podcast? Cormac Whelan: Leaders Eat Last, Simon Sinek, is probably the last one I read. I don’t do a lot of business book reading per se. I am a fan of TED talks. I try and focus on maintaining a difference between someone who’s a leader and someone who’s a manager, because there is that extra level required. There’s a distinct set of differences between the two. ET: It’s easy to talk about the what and the how. Simon Sinek starts with why. What is your why, Cormac? Cormac Whelan: Start With Why, you can do the TED talk in 15 minutes. There’s no need to read the book. We live in a technology world and we think it’s all about technology, but it’s not. It’s all about people. For me, the why is all about what difference we can make to people, whether they be employers or customers or the world at large. Cormac Whelan: It is about leveraging the benefits of technology for the greater good. Nokia has continually reinvented itself from a paper company, to a rubber company, to a technology company. It’s had its ups and downs, but fundamentally its innovation and incubation arm, or thinking, it’s always been about fundamentally choosing all time of how to make the world a better place. Cormac Whelan: Without getting into specifics, the worst one was probably agreeing with the seniors in the company at the time to a downsizing of a particular scale, knowing that it would be detrimental for the business in the medium-term. It was a short-term expediency versus medium-term loss, and I think we made the wrong decision. I agreed with that, and I knew it at the time. We regretted that, and I regretted that. We lost some very good people, and we lost a lot of momentum in business. I don’t know what my best decision was as CEO, to be honest. You’d probably need to ask other people. ET: What’s on the radar for future technology for Nokia? Cormac Whelan: 5G clearly is the next big thing. Like I said, it’s sort of here now in its prototype trial phase. We’ll see roll-outs in North America happening probably by the end of this year. We’ll see it in parts of Europe next year. We won’t really see it at scale until 2020 and 2021, and that’s going to be all-consuming for anybody in the network infrastructure business, because 5G isn’t just about mobile. It’s now the first technology that’s truly about fibre and about end-to-end fixed and mobile conversions. That’s going to be the all-consuming thing. You hear people already at some conferences talking about 6G. Let’s figure out how to do 5 first. So that’s probably going to be the next big thing that encompasses everything we do, and it’s the reason for the acquisition of Alcatel-Lucent a few years ago, is to provide that end-to-end capability. ET: What’s the one piece of technology you’d really like to see become fact, from the world of science fiction or futuristic research? Cormac Whelan: Time travel. But if you follow the practicalities in your head, you would go, ‘That just so would mess up everything.’ But I think we’d all like to do it for purely selfish reasons, and I think that would just be unbelievable. Teleporting. Teleporting would be amazing. Travel these days is probably one of the biggest banes of most people’s lives, particularly in business. So beam me up Scotty would be my ultimate goal. Cormac Whelan: Honestly, I’ve got a 20 year old daughter who’s doing psychology at university. She’s the one thing that probably keeps me up at nights for the last 20 years. You know, the future of our kids is a concern. When you have one, you just think, “What next? What next? ET: Could you share a tip for other CEOs? Cormac Whelan: Never assume everybody’s got it. There’s no such thing as over-communicating stuff. People need leaders to be constantly communicating clearly and transparency about direction, about how things are going. Good or bad. Never assume that everybody’s got it. ET: How do you see the company changing in two years, and how do you see yourself creating that change? Cormac Whelan: I think as an organisation, we’re two and a half years into the largest integration or merger that either company has gone through, and they’ve all gone through quite a few. There’s a natural assumption, on behalf of everybody in industry, that once you’re a year in you’ve done the hard stuff. Once you’re two years in, it’s business as usual. Integrations and acquisitions and mergers of this scale and size take many years to bed in, and we’re back to the people agenda again. You can integrate portfolios and you can integrate systems and functions, but people? Actually, we have a need to drive an even stronger Nokia culture. Nokia is a very culturally-driven business, but we need to drive a new Nokia culture formed out of the greatness of two previous big companies. That, I think, is one of the evolutions we need to do. I think for me, that is going to be about … All companies have strong cultural internal histories, which leads to certain silos or cliques or whatever you want to call them. I think my challenge will be to try and break down those walls and build that new Nokia culture going forward. ET: How do you prioritise your day? How much time do you spend in different areas? Cormac Whelan: I think as I’ve noticed over the last, say, 10 years or so, that the more senior you get the less control you have over your own diary. When your diary becomes this open book for everyone else, then you don’t necessarily have total control over what it is. I set a goal out with my PA every year that we’re going to try and work from home on Mondays. We’re now in the middle of August and I think I’ve done seven in the year. The difficulty is prioritising your day efficiently. I live down in Sussex; we have offices in London, Reading, Bristol, Cambridge, Birmingham and Dublin. All of which involve a significant amount of road or rail travel. So I think prioritising the day, the week, even the month in advance, is crucial to make your diary efficient. We do town halls in all the major offices every quarter. The main thing is probably to try and balance my time between customer-facing time and internal-facing time. ET: Which three technologies will influence your industry most in 2019? Cormac Whelan: I’m not going to answer it by saying technologies. I’m going to answer it by saying what the three main drivers are going to be. I mean, clearly 5G is one. I think you know that’s the answer already. But I think IOT, smart cities, and I think the world of transportation are going to be three of the biggest influences on the technology communications industry. If you look at transportation, public transportation needs massive and rapid upgrading and dragging into the 21st century. It is creaking at the seams. We know that, and it’s creaking at the seams pretty much everywhere in the world. Technology can bring that, but it’s going to cost and it’s going to take time. We have to try and increase the speed of deployment. So we see things like HS2 going on, and we see things like the contract in the UK for smart motorways going on. But actually the state of transportation improvement in towns, around bypasses and the technology ability to help all that, it’s going to be really crucial to improve that, otherwise we’re all going to grind to a halt. Smart cities and IOT technically it’s about scale. The world is going to no longer be about just carriers, but it is going to be about network infrastructure, but I think the people who own that network infrastructure and maybe even own that mobile spectrum are going to be different people to the ones we know today. Cormac Whelan: What do they do differently? I think that’s one of the things that I’m constantly looking for, is everyone thinks you need to do things the same. How and what do you decide to do differently, and why? ET: What do you do differently, and why? Cormac Whelan: I think it’s obvious from the last 20 minutes that I’m very strong on a people agenda. I think that’s one of the things that I brought when I joined Alcatel-Lucent in 2011, and that I brought into the new Nokia world two and a half years ago. I bring a stronger people agenda. I’m sure there are people in those organisations that would “No, no, no. We had strong agendas.” I would go, “Yes. You had strong words, and you had strong posters on walls, but I’m not entirely sure we had enough demonstrable people behaviour.” So I think that is one thing I very much bring wherever I go. I mentioned earlier on I’m quite transparent and very strong on clarity, so clarity of purpose is something I bring to the organisation, and to our customers by the way. I think there are far too many vendor relationships that are based on products and not necessarily true relationship-building with customers, which also requires transparency and clarity of purpose. Cormac Whelan: Well trust is built out of that, you’re absolutely right. That is the ultimate goal. To answer one of your earlier questions that I deferred, what is the thing that I’m most proud of, it’s exactly that. We are now a very strongly trusted and deeply embedded partner to our biggest strategic customers, which we were not five years ago.